Leading Senior Constable Maha Sukkar is Multicultural Liaison Officer with Victoria Police, where she promotes cross-cultural understanding to better serve the needs of the Victorian community. 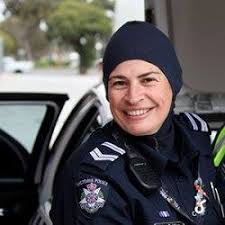 In 2004, Maha Sukkar became the first Muslim policewoman in Victoria to wear a hijab, challenging stereotypes and setting a trailblazing example for police forces around the world. In her 13 year career, Maha has taken a lead role in promoting social cohesion, breaking cross-cultural barriers, and encouraging diversity within the police. Her commitment and dedication is changing the way newly-arrived communities see the police and how police think about communities. She is the founder and president of the Victoria Police Muslim Association (VPMA), the first police association of its kind in Australia. Sanctioned by the Chief Commissioner of Police, the VPMA promotes harmony, social cohesion and the profile of Muslim police. Maha is highly respected for her knowledge, partnership-approach and strong relationships with the community. She uses her perspective as woman from a culturally diverse background to strategically and proactively approach Victoria’s most complex law and order challenges, including family violence and violent extremism. Maha has shown ground-breaking leadership in tackling underage and forced marriages. She designed and implemented culturally-specific training packages for police members and service providers, and led the “Tell Someone” initiative, which empowers school students to understand the issues surrounding forced and underage marriage. The initiative was a Victorian first, and received extremely positive feedback from the community and support from Victoria Police, the Australian Federal Police, and the Victorian education and health departments. She is dedicated in to creating a Victoria where everyone feels welcome and safe. In 2009 Maha was named “Australian Muslim Women of the Year” at the Australian Muslim achievement awards. In 2010, she was awarded the Australian Council for Women and Policing Bravery Award. In 2018, Maha was inducted into the 2018 Victorian Honour Roll of Women. This year’s inductees join more than 600 other Victorian women who have been inducted since the Honour Roll first began in 2001.